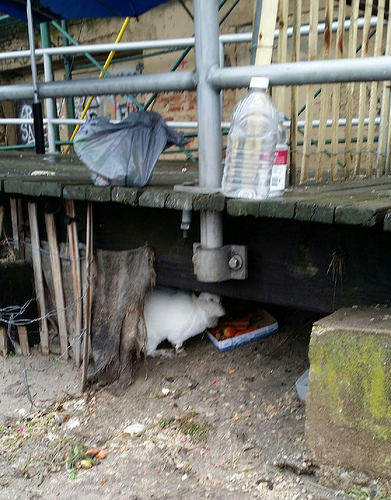 The rabbit and the cats who ran off during the December 28th pre-dawn bulldozing of the Coney Island Community Garden, where they were cared for by the gardeners, have been spotted. 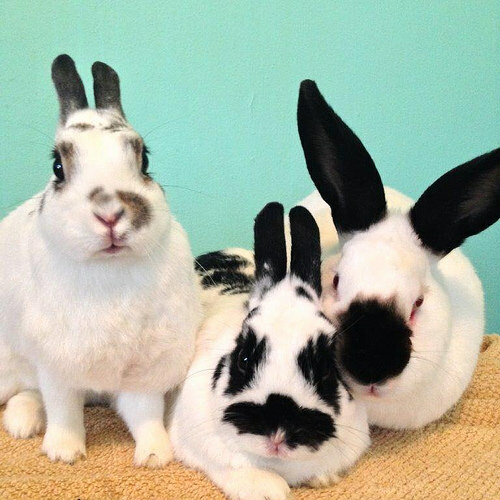 “It is so sad to see them sitting on the barren land,” said Carolyn McCrory, who sent us a photo of the yet-to-be-rescued bunny, a white rabbit with black ears. Kittens from community garden ended up at ACC, where one was euthanized and these two were rescued by Empty Cages Collective. December 30, 2013. Another sad story is that of a mother cat, a calico who has been seen returning repeatedly to the bulldozed lot looking for her kittens. 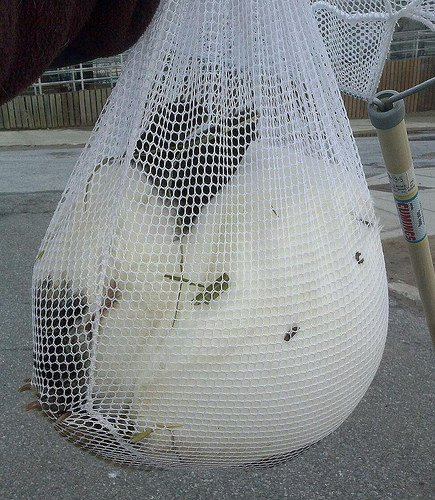 As ATZ previously reported, when a gardener collected her chickens she also walked off with three kittens. As it turns out, the next morning a cat carrier with the kittens was left on the boardwalk in front of the demolished garden. 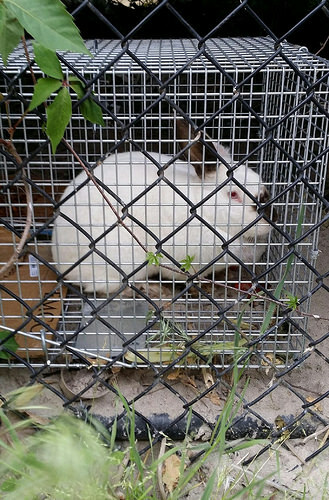 Pleas for help were posted on Facebook but before a rescuer could get there, the carrier was picked up by the City’s Animal Care and Control, which is a kill shelter. 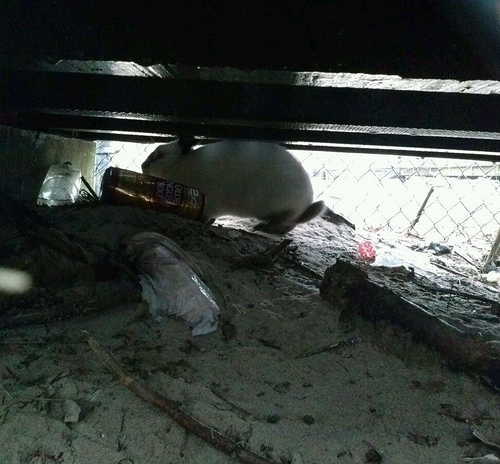 PJ McCosky of Empty Cages Collective, who has recently rescued several cats in Coney Island, was alerted and rushed to ACC to save them. 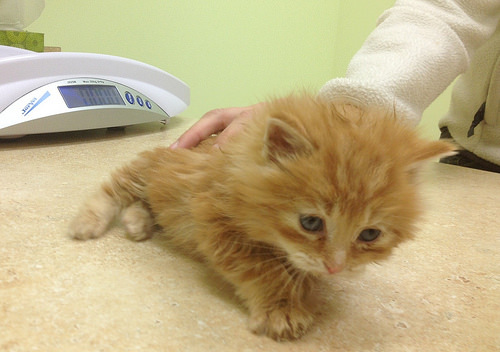 One sickly kitten had already been euthanized. 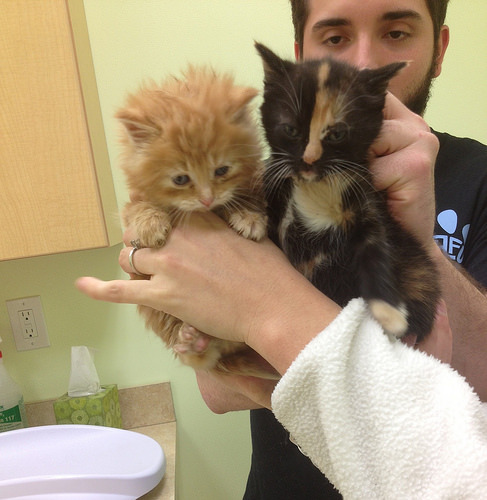 The other two kittens were rescued and are now in the care of Empty Cages foster homes. The kittens were about four weeks old when found and need to be bottle fed. 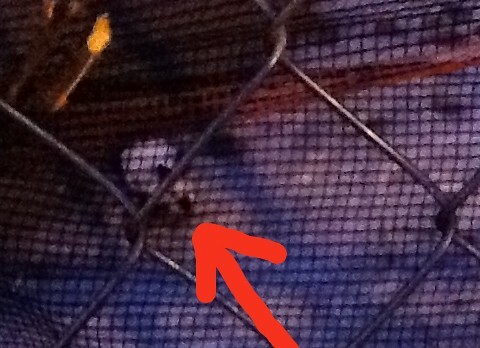 Kitten from bulldozed community garden brought to ACC and rescued by Empty Cages Collective. December 30, 2013. 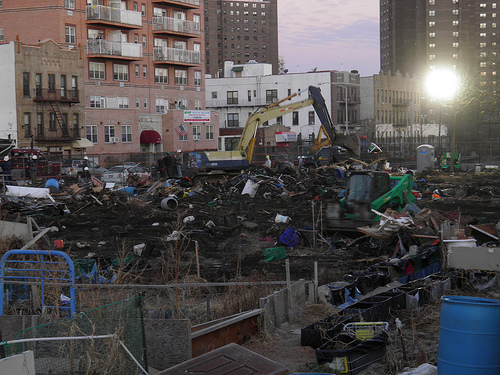 Since ATZ began covering Coney Island in 2009, the colonies of cats have been pushed farther west by the dismantling of Astroland and the demolition of vacant buildings such as the Henderson and the Playland Arcade. 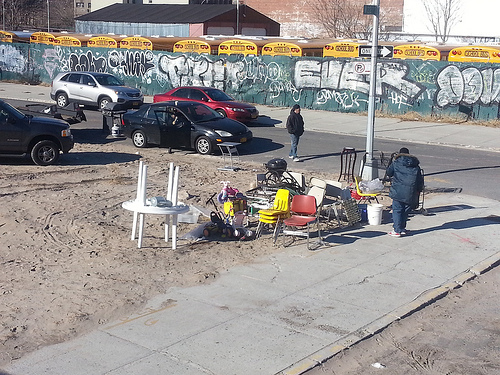 The construction on the Boardwalk at West 21st Street is causing further displacement. While there are many people feeding the cats, there is much more that needs to be done. With the new year and the new pro-animal rights administration of Mayor de Blasio, we would like to see a program modeled on Alley Cat Allies Atlantic City Boardwalk Cats Project. 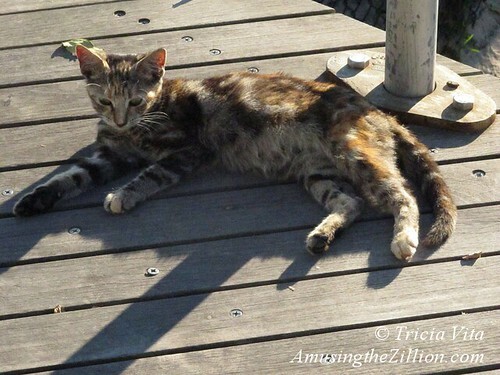 Since 2000, the national advocacy organization dedicated to the protection and humane treatment of cats has cared for the feral cat colonies along the boardwalk as part of a city-supported Trap-Neuter-Return (TNR) program. According to their website, Atlantic City Boardwalk’s famous cats draw visitors and admirers from all over the country. Can’t we do the same for cats on the Coney Island Boardwalk? 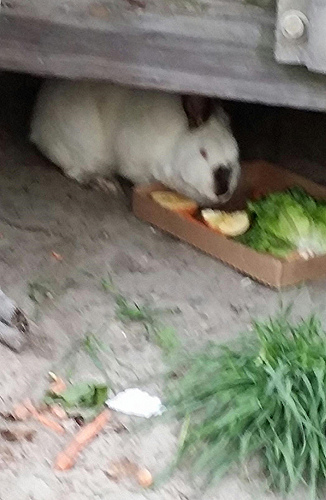 If you find a bunny under the Coney Island boardwalk, he ran off during the bulldozing of the Boardwalk community garden on Saturday morning. 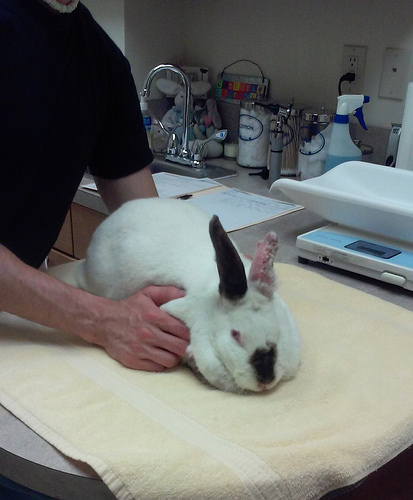 This isn’t a “coney” joke, but something we learned from the site manager. And when a gardener collected her chickens she also walked off with three kittens. The mama cat kept coming back all day looking for them. Such was the chaos that ensued in the animal kingdom when the 16-year-old boardwalk garden was abruptly razed and the plants were plowed under on Saturday to make way for the seating area for an amphitheater slated to open in June 2015. We support the rehab of the landmark Childs Building, which tourists frequently refer to as “those ruins on the Boardwalk.” But it’s barbaric to bulldoze a garden, especially at 5am on a holiday weekend, no matter the circumstances. Waking up to photos and videos of the destruction posted on Facebook brought back memories of the infamous pre-dawn demolition of the Thunderbolt roller coaster by Mayor Giuliani in 2000. 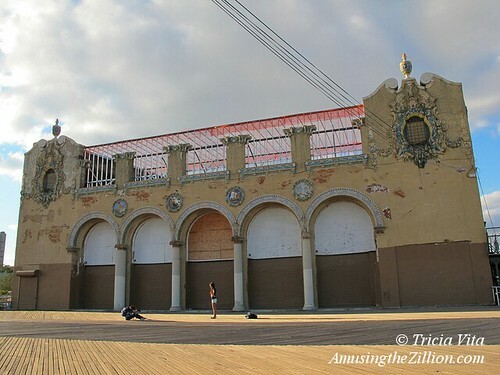 It also calls to mind Thor Equities CEO Joe Sitt’s demo of the Henderson Music Hall and Bank of Coney Island in 2010, which cruelly put a halt to Save Coney Island’s efforts to create a historic district. 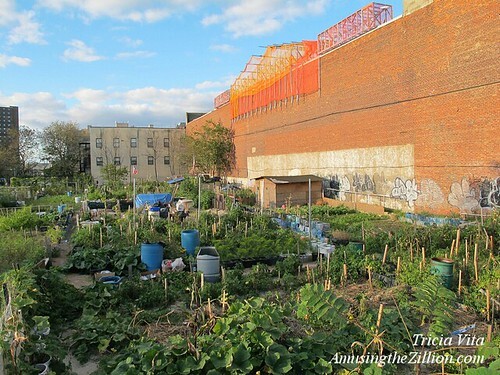 Bulldozed Boardwalk Community Garden. Coney Island. Photo by Anonymouse. December 28, 2013. As previously noted (“Clock Ticking on Plan for the Landmark Childs Building,” ATZ, September 25, 2013), the City has the funds to bring the landmark back to life since Borough President Marty Markowitz will be able to use $50 million set aside in 2010 for a $64 million amphitheater in Asser Levy Park that was halted by a lawsuit. If the $50 million isn’t spent by the time the Borough President’s third term ends on December 31, 2013, it would go back into the public coffers and be lost to Coney Island. The landmark building’s deteriorating condition is also cause for concern. After Sandy, parts of the terracotta facade cracked and began falling off. 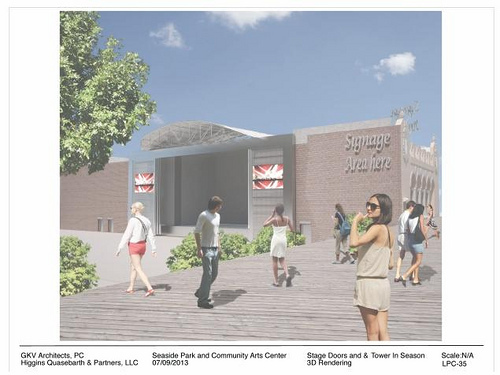 Just before Christmas, developer iStar Financial won approval from the City Council for the amphitheater project. 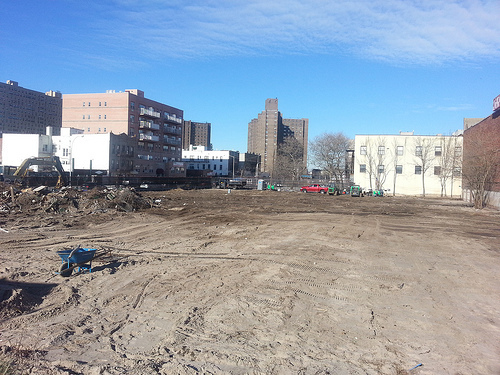 The officially “decommissioned” garden was set to be relocated to a site five blocks away. Why was it necessary to raze it, without giving the gardeners an opportunity to collect their belongings and animals and make the move? Among the items that were reportedly destroyed was a “Coney totem,” a sculpture by artist Philomena Marano. Marty Cottingham, a consultant to iStar, cited safety concerns and the need to do environmental testing and, if necessary, remediation as required by the DEP for property that was flooded during Sandy. “We have taken great lengths to do the right thing,” he told ATZ, noting that some items were put in the Childs Building and are available for pick-up. Improvements have been made at the alternate garden site, known as Surfside Garden, on Surf Avenue at 29th Street, including new topsoil and raised beds. Some gardeners say the new site is not suitable due its smaller footprint and being hemmed in by buildings. Others who were promised help relocating felt betrayed by the lack of warning. The amphitheater project will be developed and operated by a partnership between an affiliate of iStar’s Coney Island Holdings LLC and non-profit Coney Island USA with $53 million in City capital funds, and involves the restoration and adaptive reuse of the Childs building as well as the development of a 5,100 seat amphitheater with a neighborhood park and playground on city-owned land overlooking the beachfront. In addition to approximately 40 to 50 free and paid concerts during the outdoor concert season, the developer promises to host community-based events throughout the year. The Childs Building along with adjacent lots rezoned for high rise condos became part of iStar’s portfolio when Taconic Investment Partners defaulted on loans. The rezoning plan approved by the City Council in 2009 put 26 high rise residential towers and 5,000 new units of housing in Coney Island, including beachfront condos on 5.5 blocks of vacant land just west of MCU Park. August already! 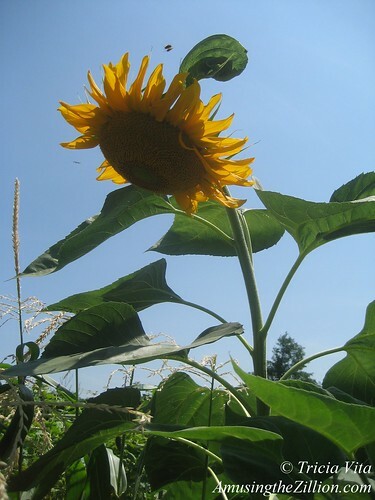 On the Boardwalk past the Parachute Jump and Childs terracotta palace, you’ll see Coney Island sunflowers and tomatoes growing in the community garden at West 21st Street.